So everyone will need to keep count of the chapters they’ve read because we’re going to read a certain number each week. As this can get tricky we have another visual aide: each chapter starts with a section from fictitious history books and we’ll watch for specific chapter openings! This will (hopefully) work! That’s right! We stop at Book Three The Prophet! Frank Herbert came through for us on this split! Everyone should strive to be at The Prophet by Saturday January the twentieth. The last week we shall read to the end of the story. With this pace we will all finish on Saturday January the twenty-seventh and then we’ll all hit play on the cheesy 80’s film adaptation and enjoy! Read at your own pace but be aware that the conversations will include possible spoilers once we hit a Saturday goal as discussing anything from the week’s reading is fair game on a Saturday and beyond. Above all else please have fun! 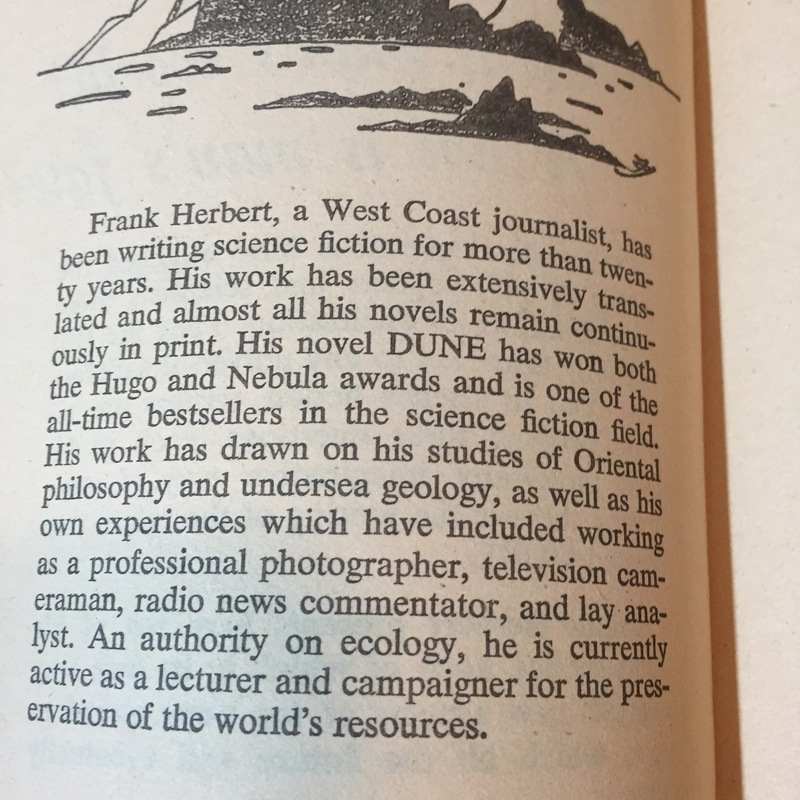 This entry was posted in Book Reviews, Frank Herbert, From My Bookshelf, VintageSciFiMonth and tagged Dune, FrankHerbert, GroupRead, ReadDune, RedStarReviews, scifi, VintageSciFi, VintageSciFiMonth on December 25, 2017 by redstarreviews. 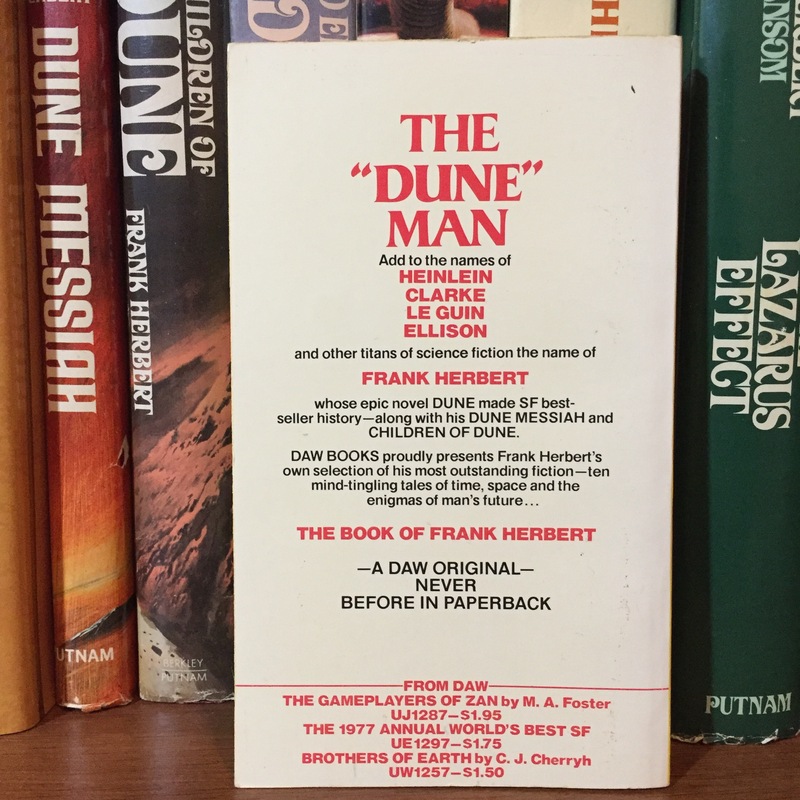 Announcing The #ReadDune Group Read For Vintage SciFi Month! Officially announcing the #ReadDune GroupRead I’ll be hosting for #VintageSciFiMonth this January! We’ll be using the #ReadDune hashtag to help keep track and follow along of each other’s posts and be able to enjoy more discussions on it! So break out your copies of Dune by Frank Herbert and let’s start spreading the word! Each week we have a target page/location goal in the book. We don’t discuss in detail anything that takes place in the book until we reach that Saturday Goal, and then we discuss only the sections we’ve read so far. You’ll find it works really well. The Group DMs are normally very fun and respectful, and allow for discussing shared emotional reactions, general observations, and encouragement to reach the goal. Once we’ve reached a goal we discuss things that happened in detail and have fun with it. If anyone hasn’t reached the goal they’ll need to be careful about the Group DMs on the weekends as that’s when a lot of specifics get discussed. I’ll be looking into the page counts of the common versions but it’ll probably be between 130-150 pages a week of reading. What are Group DMs? Everyone who wants to participate will be invited into a group DM on Instagram or on Twitter (whichever social network you prefer). There’s a limit on how many can join so there’ll be a few group DMs created. I’ll be in each one to help moderate and help keep spoilers to a minimum. We’ve got several first time readers joining in so everyone needs to be conscious about posting spoilers! That’s where the page goals will come in to play. Since we tend to have more than one Group DM I’ll also post a #ReadDune Instagram post and Twitter Post every Saturday Morning so that everyone can publicly discuss the book (up to that page goal) with everyone else easily. Ready for the cheesy fun part? At the end of it all on either Saturday the 27th or Sunday the 28th depending on people’s schedules we’ll all hit play at the same time on the fun and cheesy 80’s movie edition of Dune and have fun watching the movie together to celebrate finishing the book! Posting photos of your reading of Dune is highly encouraged! Please post away and use the #ReadDune hashtag and we’d love if you used the #VintageSciFiMonth hashtag too! Above all have fun! This is one of my favorite books, and I think it has a broad appeal. I’m hopeful you’ll like it, but there is no pressure to like it! If you don’t it’s really ok as I’m not the author, just a fan. Let me know on Twitter or on Instagram if you’ll be joining in! Check out my latest post on Instagram or my pinned tweet on Twitter to respond and let me know if you’re joining! 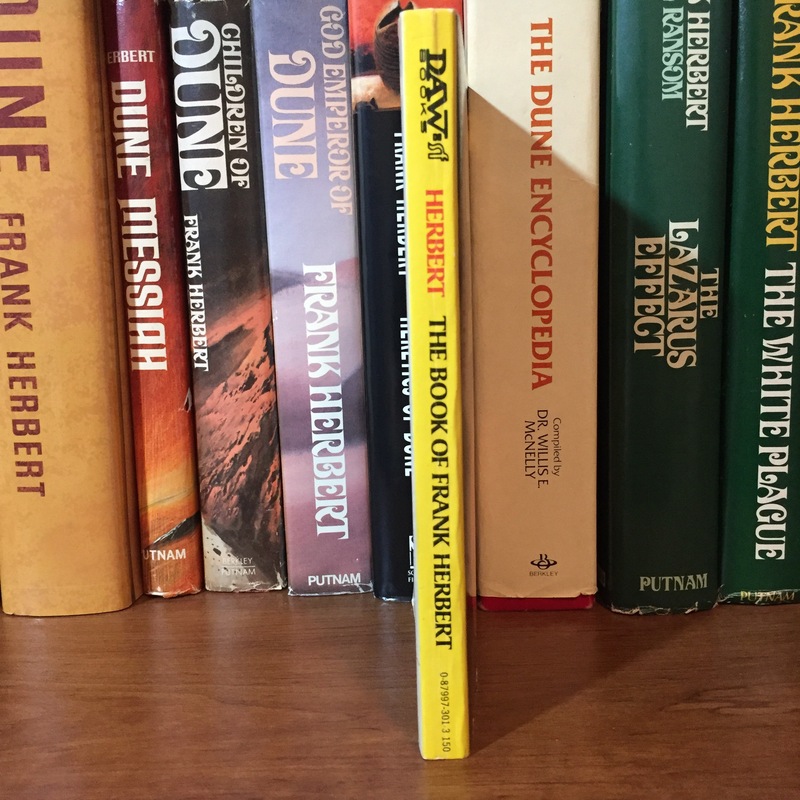 This entry was posted in Book Reviews, Frank Herbert, From My Bookshelf, VintageSciFiMonth and tagged Dune, FrankHerbert, ReadDune, scifi, VintageSciFiMonth on December 3, 2017 by redstarreviews. 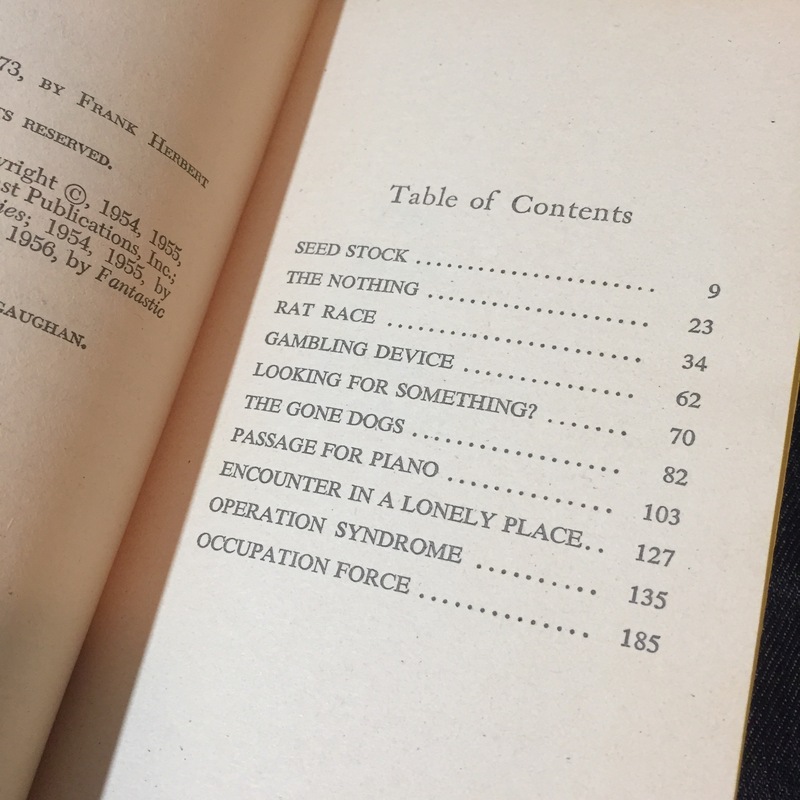 It is one of the yellow spine Daw books! We are super excited that this book will soon be in the hands of a Vintage SciFi Fan! How do you enter and win the giveaway? Very simple: Use the hashtag: #VintageSciFiMonth on any Tweet or Instagram post or (public) FaceBook post and you’ll have your name put into the drawing! With each unique post you use the hashtag we’ll put your name into the drawing again! So the more often you post/tweet about Vintage SciFi Month the more opportunities you have to win! We are limiting the giveaway to North America at this time due to cost. Sorry international readers! 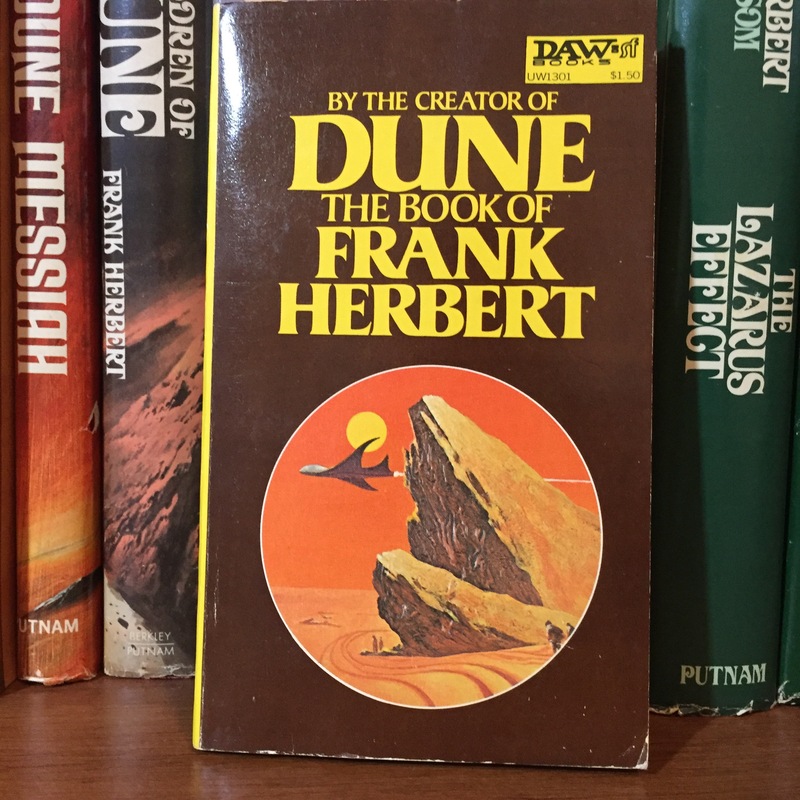 This entry was posted in Book Reviews, Frank Herbert, VintageSciFiMonth and tagged Dune, FrankHerbert, Giveaway, RedStarReviews, scifi, Vibtage, VintageSciFi, VintageSciFiMonth on January 1, 2017 by redstarreviews.